Like many before her, triple j presenter Bridget Hustwaite got her start in the industry volunteering on community radio. This year she was handed the reigns of the station’s prime-time Good Nights show. 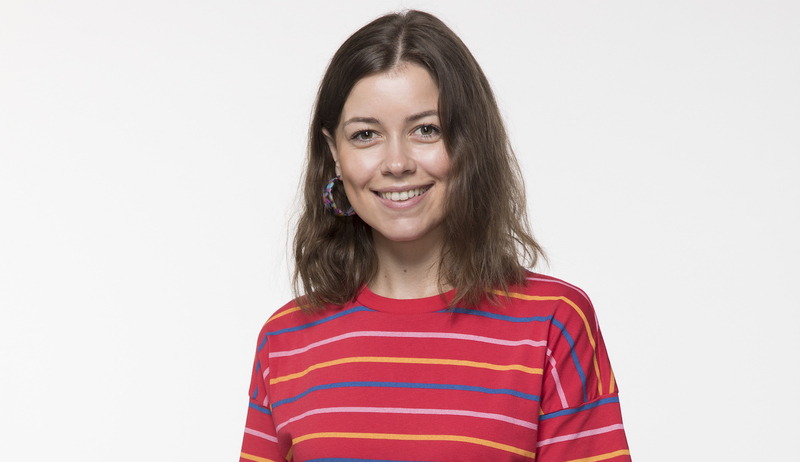 Moving from fill-in shifts and mid-dawns to take over from Linda Marigliano was never going to be an easy feat, but Bridget has wasted little time winning over triple j’s audience. Bridget answers 10 Questions from Radio Today. What’s the Bridget Hustwaite story? The Bridget Hustwaite story is a girl from regional Victoria growing up as a music fan but never knowing it could be a real career until she was 21 years old and came second in the Channel V Presenter Competition. Then, after years of volunteering in community radio/TV, writing for online blogs and endless mid-dawn shifts and fill-ins, this Ballarat girl moved to Sydney for a life-changing opportunity to host Good Nights on triple j! I started out pursuing a career in music TV presenting but once I joined SYN (Student Youth Network) in Melbourne, I was introduced to a whole new world of radio. I also listened to triple j heaps and was really inspired by Zan Rowe and Linda Marigliano. I was even a Guest Selector on Good Nights with Linda in 2012, so it’s pretty crazy that I’m recruiting Guest Selectors as the host 6 years on! What’s your favourite thing about triple j? There’s a lot of things! Campaigns like the Hottest 100, triple j Unearthed High and even our Splendour In The Grass coverage make me really proud to be part of a team that is so invested in bringing new music to our listeners. But I particularly love seeing the reaction of artists when their songs get played, especially upcoming local acts. Seeing how much it means to them really makes me realise the incredible platform we have to support Australian music. How have you found the transition into Nights? I think it’s been really great! Obviously, my body is loving the 6-9pm time slot way more than the 1-6am grind on mid dawns, and although it’s been massive shoes to fill, I really feel like it’s been a smooth transition and the audience has been so kind to me. My approach heading into Good Nights wasn’t like “this is MY show now”, I’ve always tried making it clear that this show is about the listeners, and what new music they are loving. Their recommendations are so important to me, and that’s what Good Nights is all about. It’s a community of new music fans, we are all the same! I’m in the office at least 4 hours before I go on air, so that time is used to catch up on emails, listen to a whole bunch of new music, liaise with the music department regarding any premieres or interviews I have lined up, and working with my producer on what music news to cover in the show. I take my premieres really seriously so I like to ensure that I am spending as much time as possible on researching the artist and their new song that I’m about to play for the first time. Premieres are a big deal for any artist, so I want to give their art the introduction it deserves. How does your personality different from on air to off air? I’d like to think that I’m the same person on air as I am off. I’m not trying to be anyone else or putting on a persona. I like to think that I’m just a regular music fan with a microphone. I’m really no different to anyone, especially my listeners. But I guess by hearing how energetic I am on air, you’d probably be surprised to learn that I would take a night in my dressing gown and a cup of tea, over a night out any day! I love that nanna life! What’s one skill you’ve mastered and one skill you’re currently working on? Tricky question! It’s hard to say what skill I have mastered because I’m always learning and wanting to improve. But if I had to choose something, I’m really happy with how I have adapted to live outside broadcasts. My first one was in February at Adelaide’s Laneway Festival and I just recently worked at Splendour in the Grass, so learning the ins and outs of a live broadcast has been really insightful. I definitely haven’t mastered it but I did survive! One skill I’m particularly eager to continue working on is my interviews. I love picking up things from listening to Zan, Linda and Richard and how they interact with artists. You can always find new angles and get new ideas so I really look to them for that stuff. I feel like I had the right expectations when starting out – I knew it would be a grind and that I had to work my way up, but I think I would tell myself to just enjoy each moment as it happened. I was always thinking about what was next, but it’s important to make the most of the present and always have fun! I think I would still be working somewhere in music, perhaps through a label or more specifically, A&R. I really enjoy following artists through their journey so lending a hand with their progression and development is something I would find pretty rewarding. Sum up your radio experience in three words.